The stretched low body, tapered handles and stylish exhaust pipe of Ducat Diavel gives a refreshing look which is well appreciated by bike enthusiasts. The comfortable seating position with quality suspension makes sure that the rider enjoys the ride even off road without much problem. The huge wheels and larger fuel takes adds an aggressive, macho look to the bike and it serves as the main reason behind its magnetic appearance. 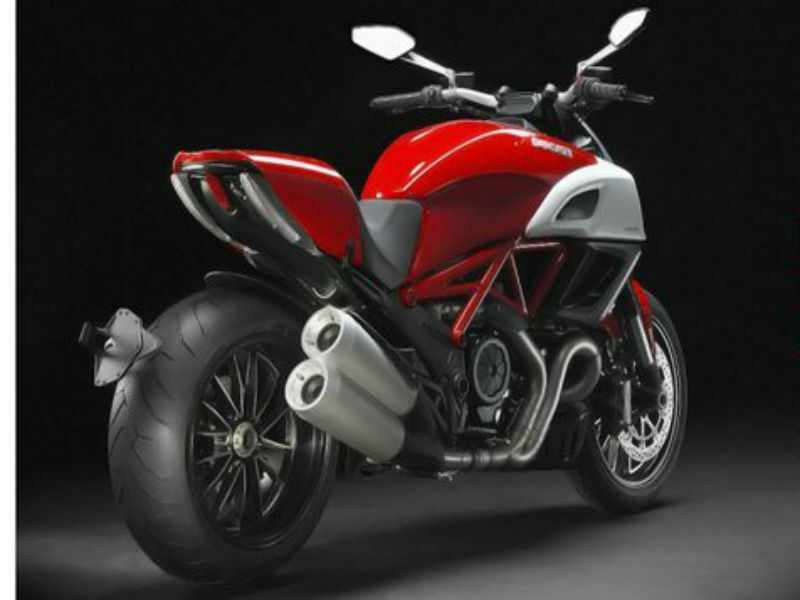 Thus with its style and all new latest technology Diavel serves as one the world's most sought sports bike. The sports bike Ducati Diavel is known for its great performance and racy speed is equipped with powerful 1198.4 cc, Testastretta 11° engine which takes care of the smooth and adoptable jolly ride. The inclination of 11° also helps in the fuel efficiency and assures the proper fuel combustion thereby lowering the exhaust. This type of engine of the bike is so designed that it helps to achieve high torque at low rpm. The maximum power generated by this potent engine is about 119 kw at 9500 rpm and the highest torque achieved is 127.5 Nm at 8000 rpm. 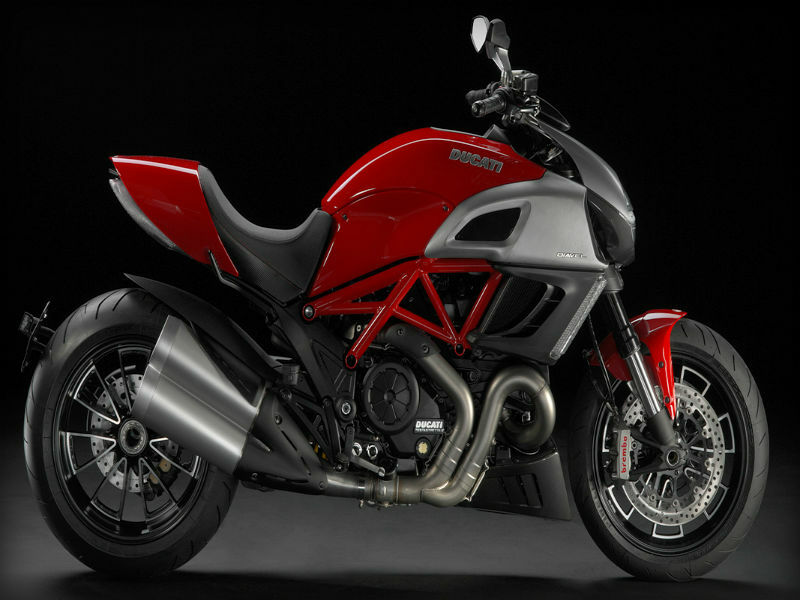 The impressive motorcycle Ducati Diavel is unique and attractive in its style and technology. The muscular body with heavy mass concentration at the front adds a powerful image to the vehicle. The flat rear tyre, broader seat, the massive headlight and lean rear end gives a gothic look which is extremely fascinating. Further with the aluminum cast wheel and larger wheelbase the bike looks eye-catching and exclusive. The trendy graphics on huge petrol tank and elegant instrument are other noted features of the bike. When it comes to riding and handling, this bike serves as a huge surprise. The wider wheel and extended handle bar gives greater comfort the rider. The main plus point about the vehicle is its fantastic suspension system including the front Marzocchi DLC coated 50mm fully adjustable usd forks and the rear progressive linkage with fully adjustable sachs monoshock with aluminium single-sided swingarm. This latest and advanced suspension of the bike assures jerk free smooth ride. Further the braking system with the ABS facility at both the wheels guarantees great control over the bike even at higher speeds. 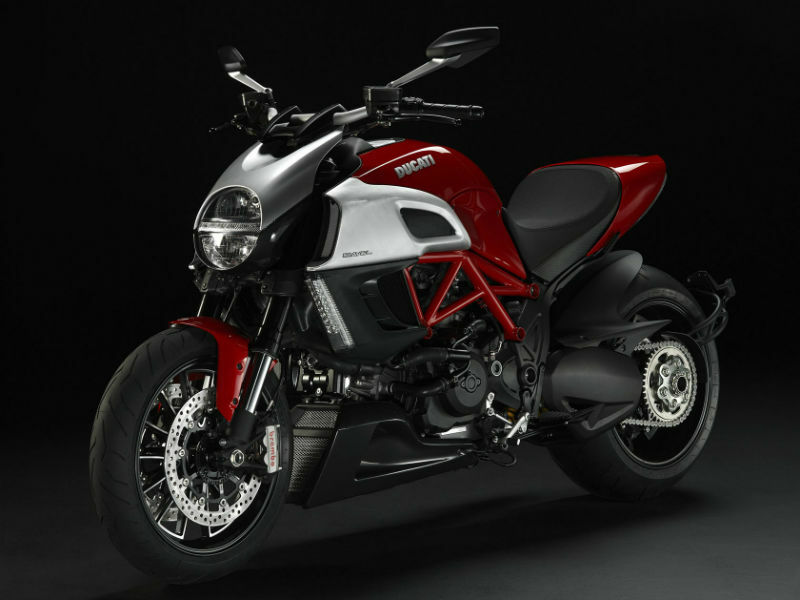 With its powerful performance, Ducati Diavel adds soul to the stylish cruiser. This aggressive looking bike gives the mileage of about 8 to 10 kmpl under varied driving condition. Ducati Diavel, one of the best superbikes in the world is available in two new attractive colors namely diamond black and red. The ex-showroom price of this magnetic bike is about Rs. 20,47,919.